This Friday and Saturday night, at 11:30pm, on Comcast channel 10 in Western Chicagoland, and, throughout the entire state of Illinois, on AT & T U-Verse channel 99 (click on "Aurora"), The Bone Jangler, Enchantress Nocturna, and HARMony present "The Horror Of Party Beach"! Saturday Afternoon @ 2pm CST, Go To www.FVTV.info Online, Or Local FVTV Channel 17, and watch The Bone Jangler and Master Gregory host a remixed/revamped CLASSIC "Daytime Dungeon"! 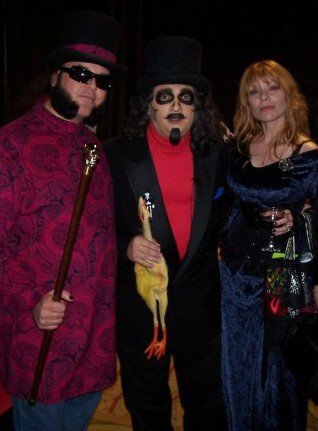 Saturday night on ME-TV's Svengoolie: Sven celebrates the 50th anniversary of Star Trek as he presents the 1964 unaired pilot for the series "The Cage"
Follow The BONE JANGLER On Facebook! Check out the Fans Of Horror Hosts group today! Watch us online on The Vortexx! Look for showtimes at The Vortexx!